All routers are running EIGRP protocol as well as multicast routing. All transit interfaces have been configured as Sparse Mode. All routers in the topology run PIM Sparse Mode. 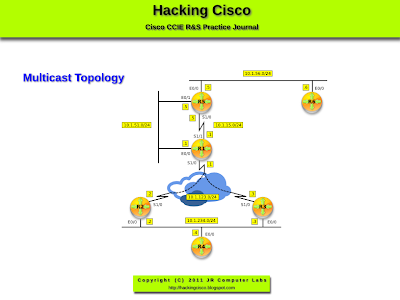 Configure R1 as both the RP and the Mapping Agent for all multicast groups. Use Auto-RP to disseminate this information. Do not change the PIM Mode (Sparse Mode). RP should advertise itself as RP every 10 seconds. Configure R4's Et0/0 interface to join the group 224.40.40.40. Ensure that R2 registers the group with the RP. Configure R4's Et0/0 interface to join the group 224.40.40.40. Ensure that R2 registers the group with RP. Before configuring the 'igmp join-group' let's see which router is the DR on the subnet. Since all routers have the same priority (p=1), the highest IP address (here: R4) has been elected to be PIM DR on this segment. DR is responsible for registering multicast clients/multicast feed with RP (group/multicast traffic registration). Unlike OSPF's DR, the PIM DR role is preemptive. Pic. 3 - R2 Becomes PIM DR.
R2 is the PIM DR now. It registers the group 224.40.40.40 with RP (look below). Pic 4 - R2's Group Registration.